March 20, 2017 – DJI, the world’s leading maker of unmanned aircraft systems, and Skycatch, the leading enterprise drone cloud software platform announced today they are expanding their partnership and launching a 3D aerial mapping bundle, the Reality Capture Package. 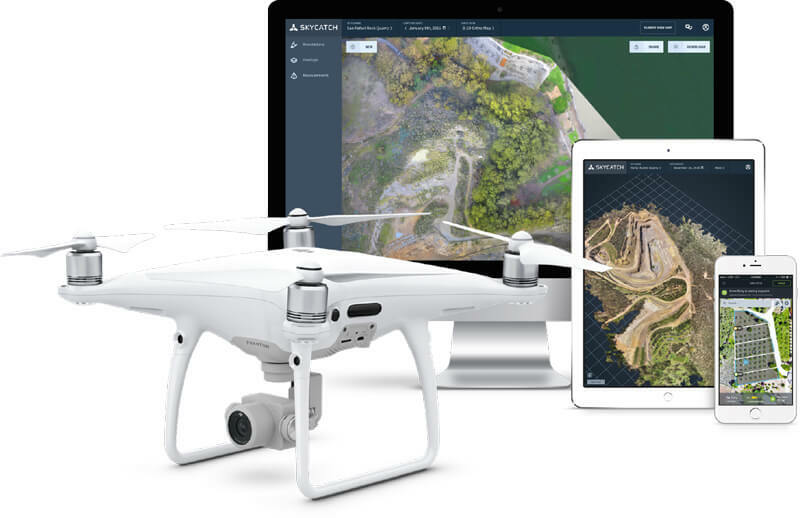 Featuring the latest DJI Phantom 4 Pro and Skycatch Pro subscription, the all-inclusive package will come with everything you need to create, share, and analyze high-resolution orthomaps and 3D models. Released in November 2016, the Phantom 4 Pro provides a powerful imaging system with the smartest flying camera on the market. Narrow sensing enhanced obstacle avoidance sensitivity allows the drone to adeptly fly through complex environments, making it perfect for industrial applications like construction and mining. Skycatch software automates flights for drones to autonomously capture images, and then process them into orthomaps and 3D models, complete with a suite of analytical tools. The comprehensive package allows users to export their data into a variety of outputs, including Contour maps, Digital Terrain Models, Digital Surface Models, and PDFs. Users can measure volumes and overlay CAD plans on orthomaps, which, along with point clouds and 3D meshes, can also be exported into any software such as Autodesk Civil3D and Navisworks. The Reality Capture Package is available for sale on www.skycatch.com/reality-capture and www.dji.com. Read the full press release at enterprise.DJI.com. Skycatch creates industrial strength products, services, and solutions to power the most complex projects on the planet. Our mission is to capture the world's data and create visual intelligence to help people operate faster, safer, and smarter than ever before. DJI is a global leader in developing and manufacturing innovative drone and camera technology for commercial and recreational use. DJI was founded and is run by people with a passion for remote-controlled helicopters and experts in flight-control technology and camera stabilization.